Definition at line 32 of file CEvaluationNodeVariable.h. Enumeration of possible node types. The typing of variables must be handled by the tree. Definition at line 39 of file CEvaluationNodeVariable.h. Definition at line 29 of file CEvaluationNodeVariable.cpp. Definition at line 35 of file CEvaluationNodeVariable.cpp. Definition at line 42 of file CEvaluationNodeVariable.cpp. Definition at line 48 of file CEvaluationNodeVariable.cpp. Definition at line 63 of file CEvaluationNodeVariable.cpp. References CEvaluationTree::getVariableValue(), mIndex, mpTree, and CEvaluationNode::mValue. Definition at line 50 of file CEvaluationNodeVariable.cpp. 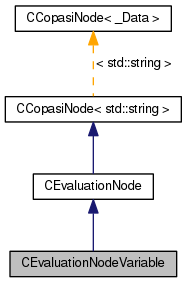 References C_INVALID_INDEX, CCopasiNode< std::string >::getChild(), CEvaluationTree::getVariableIndex(), CCopasiNode< std::string >::mData, mIndex, and mpTree. 60 return (getChild() == NULL); // We must not have any children. Definition at line 68 of file CEvaluationNodeVariable.cpp. Referenced by CMathEventN::CTrigger::compile(), CMathContainer::copyBranch(), CDerive::deriveBranch(), CFunctionAnalyzer::evaluateNode(), and CFindDimensions::findDimension(). Definition at line 82 of file CEvaluationNodeVariable.cpp. References CMathMl::fixName(), CCopasiNode< std::string >::mData, and mIndex. Definition at line 71 of file CEvaluationNodeVariable.cpp. Index of the variable used to retrieve its value from the tree. Definition at line 117 of file CEvaluationNodeVariable.h. Referenced by calculate(), compile(), getIndex(), and getMMLString(). Pointer to the evaluation tree. Definition at line 112 of file CEvaluationNodeVariable.h.